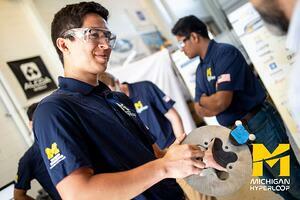 For approximately 60 University of Michigan students, this summer is unlike any other. As participants in Elon Musk's Hyperloop Pod Competition, the students worked tirelessly adjusting their team's pod design, testing controls and functions, and completing documentation after classes ended in the spring. Even full-time jobs and long distances couldn't stop them from fulfilling this project, goal, and dream. As they approached the July 22nd competition, we caught up with Stephanie Shantz, Michigan Hyperloop member, to learn what the team worked on this summer and how they're feeling about the big day. Here's what we learned. When classes ended in the spring, many team members moved home for the summer or traveled cross country for internship opportunities. But 5-10 students, known as the on-campus crew, stayed local to work on the pod, finish final assembly, and run some tests. "Kudos to those guys," Stephanie says. "They'd come in after a full work day and spend all night working on the pod." The on-campus crew used a messaging app to update team members about the progress of the pod and voice any questions or concerns. There were also weekly calls that addressed the technical and documentation side of things. When an issue arose, the team discussed how best to help from afar. "Our team mentality has always been the more brains the better," she says. Stephanie, currently interning in Washington D.C., even helped an on-campus team member fix a leaking brake valve after assessing the issue via video chat. "Technology makes it a lot easier," she says. In addition to addressing concerns, remote team members were able to help in a different way — by completing documentation. The team worked until the last minute fine-tuning details and double checking functionality. On July 9, the on-campus crew loaded the pod into a Meijer Supermarket semi-truck. From Ann Arbor, it would be more than a 2,200-mile trek to SpaceX in Hawthorne, California. One week later, when Michigan Hyperloop's approximately 20-person race team arrived at SpaceX, they were once again faced with tackling issues with long-distance teammates. This week, the race team will work diligently on last-minute adjustments and the first rounds of real testing. The only catch? Only 15 people can be on-site working on the pod at a time. "It will be a long, sleepless week of stress," Stephanie says. But one that's well worth it. Additional team members plan to fly out for the big event on Sunday, when Michigan Hyperloop competes against 19 other schools for the fastest pod that can successfully stop. "It's crazy to think it's all finally coming to a head," Stephanie says. "It will be really rewarding to see all of our hard work actually pay off. Even though we run tests on our own, it's nothing like putting the system on a track and letting it go. We haven't seen the system actually push the pod forward. It will be really cool to see it function for the first time." W.C. Branham won't be at the competition on Sunday, but our President, Troy Branham, is still very excited about and proud of UM's progress. “The UM Hyperloop team has been focusing on this stage of the contest for many months and they are at that point where it’s down to just a few days before the competition. I’m sure the adrenaline has kicked in. These young men and women are extremely dedicated and professional. It’s been a pleasure working with and supporting them. They are already winners. Best of luck and Go Blue!" For updates on the competition, follow Michigan Hyperloop via Facebook, Instagram, or LinkedIn. You can also follow @Hyperloop on Twitter.